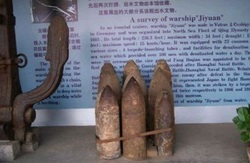 Japan's next move was to capture the “unbeatable" naval base "Weihaiwei" and to destroy the Beiyang fleet. 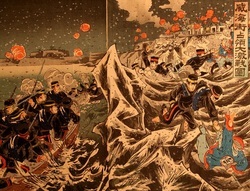 On January 30, 1895, the Japanese invaded Weihaiwei. 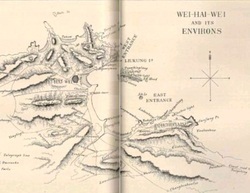 After 9 hours of fighting, the Beiyang Army retreated and abandoned their forts. The battle then shifted to sea. The Beiyang Fleet attacked the Japanese troops, but the Japanese Fleet eventually came together and sank many Chinese vessels. 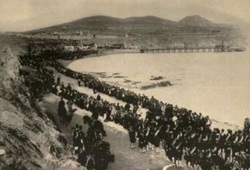 Japanese celebrating after sinking Ding Yuen. 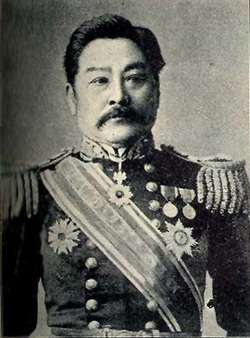 A Japanese win was apparent, so Japanese Admiral Ito wrote a letter to his close friend, Admiral Ding Ruchang of the Beiyang fleet, asking him to surrender. Full text of the Letter between Admiral Ito and Admiral Ding. On February 12, 1894, Admiral Ding formally surrendered the Beiyang Fleet and the remaining forts to the Japanese. Japan had won the battle. Admiral Ding, ashamed with defeat, committed suicide afterwards. 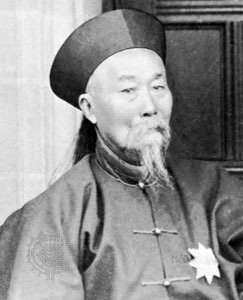 Admiral DIng Ruchang right before he committed suicide. Depiction of Ding Ruchang commiting suicide. It clearly portrays the dire mood Ding felt upon losing. China decided to abolish their navy. Japan was now in control of China's strongest cruisers and naval ports.